Learn how to make a simple frame basket using willow grown on the Somerset levels. You will learn the techniques involved in producing beautiful, functional baskets, and leave with a completed work of your own. A warning; basketry is addictive! 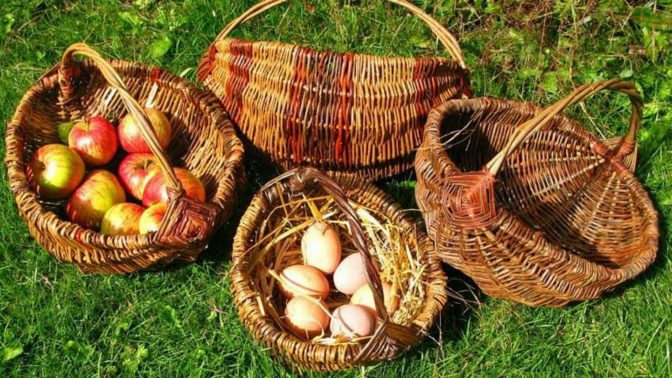 Frame basketry – sometimes called hedgerow basketry – is a simple form of basketry that is quick to learn. Once mastered you can go on to create a variety of designs in different shapes, sizes and colours, and suitable for many uses. Most students can expect to complete two baskets on this course. Suitable for all skill and experience levels. An introduction to frame basketry for complete beginners, or a useful refresher for those with some experience. Basketry is one of the most ancient crafts still practiced today and a key part of Somerset’s rich heritage. Sarah Webb is a highly skilled traditional and contemporary willow artist who was apprenticed to a traditional Somerset basket maker. She is an experienced tutor who enjoys passing on her skills, both technical and creative.